The multitude of ideas that find expression in the shapes of canes is amazing. Canes were made of whalebone, glass, paper disks, or wood. Their handles were formed in silver, ivory, porcelain or horn and were carved into the shapes of skulls, hands, animal heads, or balls and could be opened to reveal compasses, watches, dice or cigarette lighters. 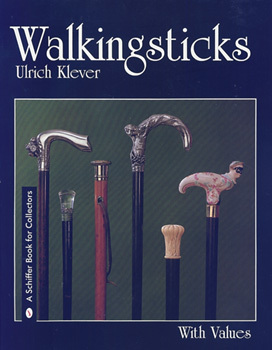 The functions of the cane were endless. Filled with hundred of color photographs and pages of fascinating history, Walkingsticks is a book to be enjoyed by collectors and craftsmen alike.